This is the second in a three-part series (read the first article here) of articles written by Laura Scott Dawson, producer of the Mustang Family All Breed Reunion Ride, and enthusiastic proponent of mustangs. She has owned mustangs for over 20 years and currently enjoys eight uniquely individual mustangs on her Texas ranch. That number, as Laura says, is ALWAYS subject to change! In Part 1 of the Mustangs vs. Domestics article, published in our February 2016 issue, Laura Dawson showed us some of the physical characteristics that differentiate Mustangs from domestic horses. She has extensive experience with both kinds of equines, having bred and raised American Quarter Horses and American Paint Horses before wild mustangs entered her life. This month, Dawson takes a close look inside the minds of Mustangs and domestically-bred horses. Prepare yourself to become entranced as she leads us into the fascinating world of equine thoughts, instincts and behavior. ​Differences in the minds and behaviors of mustangs versus domestic horses can be summed up in one word-A-W-A-R-E-N-E-S-S. Being aware of its surroundings and its herd is what has kept mustangs alive for hundreds of years. Domestic horses have had the luxury of relative safety and in some cases have even grown a little dulled to their environments. Time after time I have observed a new Mustang see and study things that weren’t even in my perception. The small wild animal hidden in the tall grass, a neighbor’s livestock several ranches over, a piece of paper caught in the weeds on the other side of the tank, will cause them to stop and give the “look”. The look isn’t about fear necessarily; it is a full concentration and study of the object or creature. If there was ever a time when you could quite literally see their “wheels turning” this would be it. I have one mustang whose greatest game is finding and pointing out hidden bow hunters when riding and hunting seasons overlap. And no, the hunters don’t find that too amusing. Over all, I truly enjoy the new perspective their far-reaching sight and awareness adds to my life. 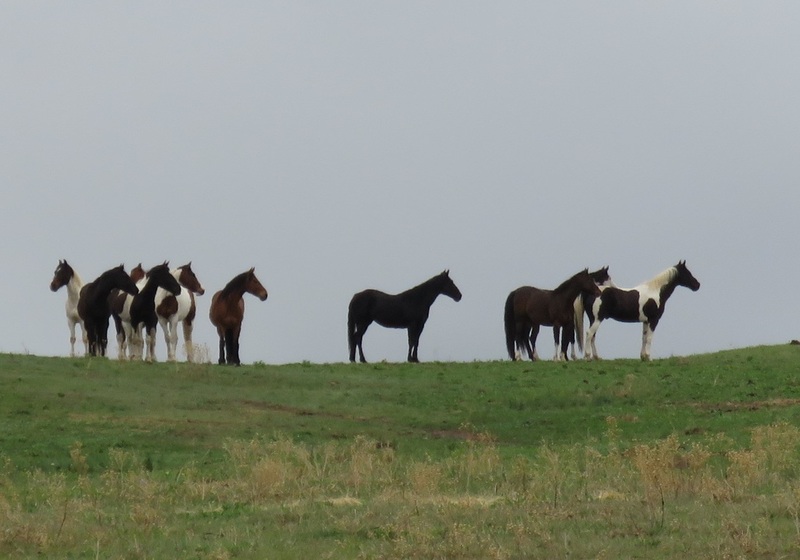 A Mustang herd studies and processes their environment. 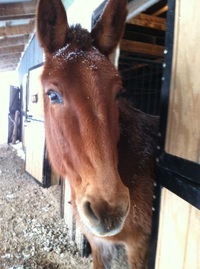 Instincts make a decided return to my Mustangs’ behavior when the stress level is up. For example, I think they are more protective of their young than domestics when they give birth. 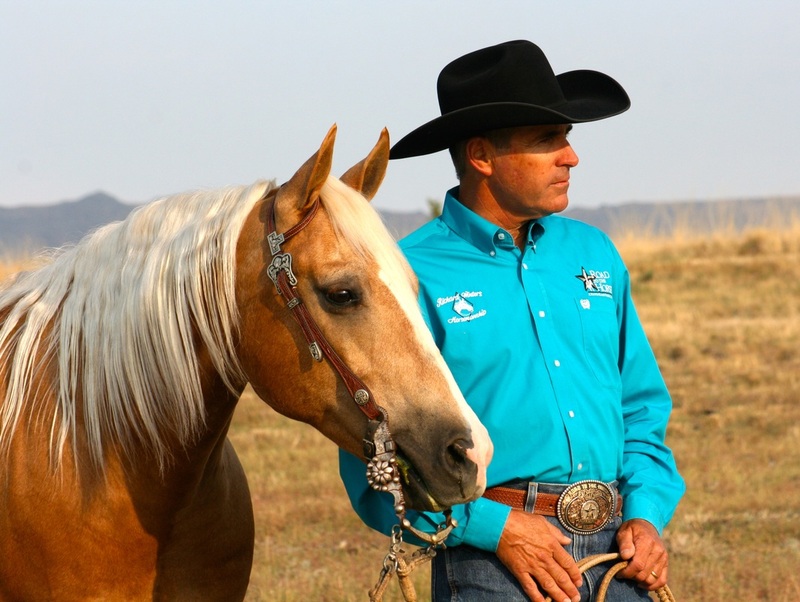 The mares tend to always see males as stud horses even after they have been gelded. All of them more closely watch each other for warning signs if one has sensed danger. When they are transported to a new competition or trail riding site, they tend to stick more closely to the herd - me and/or their travel companions. They are very stoic if injured. No need to call attention to a weakness in case predators might attack or higher-ups in the herd use it as an opportunity to move up the social ladder. Mustangs are more herd savvy than domestics. They’ve had much more experience living in a herd environment than the majority of domestics. As a result they “get” the rules of a herd. Foals assume the social status of their mothers. They will be naturally weaned in that time and will learn how to approach other horses. Lesser horses eat and drink last. The stud is there to watch for danger and breed but a wise mare is in charge of day-to-day living. When all herd members understand the social rules there is much less strife. The rules can often be enforced with just a look or a pinned ear. I have witnessed many a new domestic join my herd and have to learn the rules repeatedly the “hard” way because they just don’t understand how to act in a group. Add a new Mustang to an existing herd of domestics and people will often say they “took over” the herd because they come in and set the rules to reflect all they learned in the wild. Mustang learning in their new domestic situation will be the final subject of this three part series. Please check back - in the April issue of the ​Wild Heart Mustangs™ e-zine when I delve into the trainability of Mustangs versus domestics. Lonestar Lawman has a soft eye that sees EVERYTHING! Many people have theorized that this hyper sight of Mustangs causes them to be unpredictable and flighty, but I look at the trait in this way. My Mustangs are very intelligent; they not only see the object but are making decisions about the thing they see. Will it come closer? Have I seen it before? Does it pose a threat? Can I eat it? Can it eat me? Is it a concern at all? While they are doing this analysis they stand very still. Then, based on their initial thoughts, they are very curious or make moves to avoid it at all costs. Mustangs are very good at deciding and moving to the decision part of their analysis - if they didn’t do that well, they would constantly be running away from everything. That would leave no time for eating, procreation and resting! The majority of my mustangs, once gentled and trained, will then decide to move on to whatever task I have given them. ​Wild Texas Rose protects her foal instinctively. Wild Mustangs setting the rules of the herd. The Mustang Family All Breed Reunion Ride is an all-inclusive week featuring 14 of the very best clinicians offering over 40 clinics. Any way you add it up equals the equine experience of a lifetime! In the February issue of the Wild Heart Mustangs™ e-zine, we brought you the concept behind this unique equine experience. Our March issue introduces you to some of the clinicians you'll have an opportunity to live and learn with at the June 2016 event. The event's featured clinicians are Ken McNabb, Richard Winters, Dan James and Susan Harris. They're supported by Marsha Hartford Sapp, Mark & Miranda Lyon, Lanny Leach, Cindy Brasfield, Steve Smith, Mary Miller Jordan, Chad & Christiana Wenger, Greg Robinson, Elisa Wallace and BJ & Maryanne Grimmett. Preparing for performance – establishing the body control necessary for higher-level maneuvers. Equine evaluations – understanding where your horse is at and taking them to the next level. Beyond the first ride – how to avoid the perpetually green horse. What were your first thoughts regarding owning and riding a Mustang? Do you have a favorite Mustang? Do you change your training plan in any way when working with a Mustang? Click here to read more about Mary Miller Jordan. Once you've met and worked with Mary Miller Jordan you'll understand how difficult it was to put her amazing energy, positivity and passion for horses and people into just a few words. Already an accomplished rider from youth on, she had her start with mustangs in 2010 with an entry into The Mustang Heritage Foundation’s Supreme Extreme Mustang Makeover. Her entry, a mustang named for her father-Lindsay’s Faith made the finals in that competition. The mare also later entered and won the title of America’s Favorite Trail Horse and was immortalized as a Breyer Horse model. Mary has also published a children’s book telling Lindsay’s story - Silver Mane. 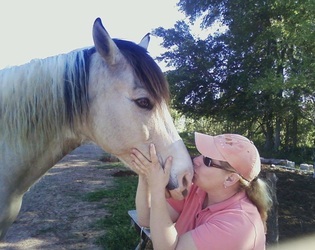 Cindy Brasfield is a large animal veterinarian in South Alabama. Her hobbies are training mules, Mustangs, and working dogs. She has been riding horses since age 5, trained her first wild captured Mustang at age 19, and has been involved with the Extreme Mustang Makeovers since 2008. Click here to read more about Cindy Brasfield. Sweet Potato Goes to School in March! Last month we introduced you to the Lainharts' mule, Sweet Potato (read the article here). 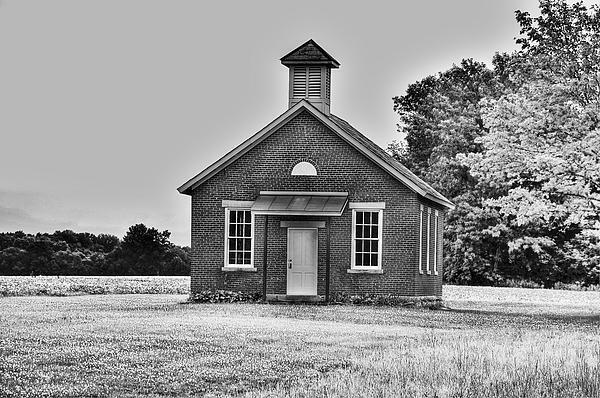 Sweets is old enough for school now....check back in the April Issue of Wild Heart Mustangs to see how Sweets is doing at school.